Hotelier Indonesia - Midscale (USD 40 – 101): Having the strongest domestic component amongst segments plus the price point most attuned to the mass market, hotels within the Midscale enjoyed the brightest year. Occupancy grew 8% (last year it dropped 6%) whilst ADR only fell marginally with the resultant RevPAR up between 5 and 6% YTD September. In the future, although the Midscale category will continue to face the heaviest pressure from forecast new supply (~ 40% of total) it is also the best placed to absorb the increased volume tourist base. 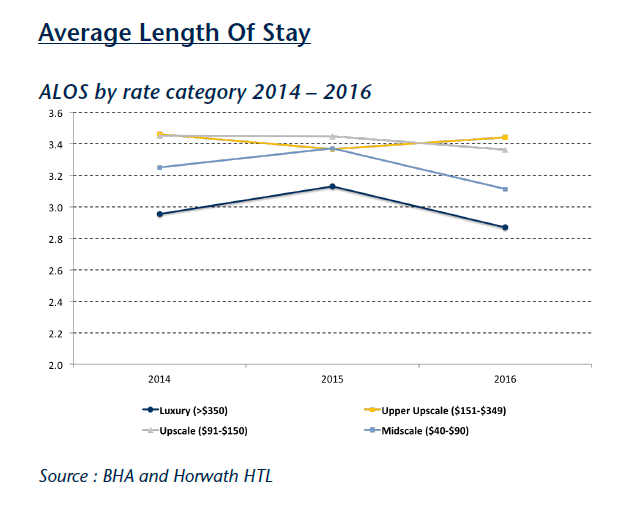 Year-end 2016 we have witnessed a fluctuation in average length of stay depending on rate categories. In the Luxury, Upscale and Midscale markets, ALOS is down but it was up slightly in the Upper Upscale market. As seen in the graph the shortest is Luxury with 2.9 days, down from 3.1 days in 2015. The largest drop was 0.3 days in the Midscale category. It is the Others market (the less densely populated accommodation areas) that exhibits the weakest average length of stay (2.3 days only) which may indicate that it is a side-trip and not the main destination for a tourist’s Bali holiday. This is to be read with care however, as it dropped significantly in 2016. The other market where ALOS dropped in 2016 was Legian/ Seminyak down 0.5 days to 2.9 days. Jimbaran and Nusa Dua/ Benoa enjoyed increases in ALOS in 2016, with the Jimbaran sub-market enjoying the longest length of stay of 3.9 days. With arrivals up, occupancy performance across all areas has improved. Interestingly in each area, except Others and Nusa Dua there was a uniform increase in occupancy of 2%. 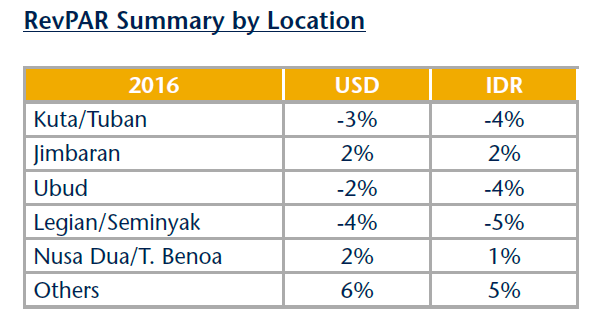 Nusa Dua and Others both enjoyed 6% increases in 2016, both having also dropped 4% in 2015 y-o-y. 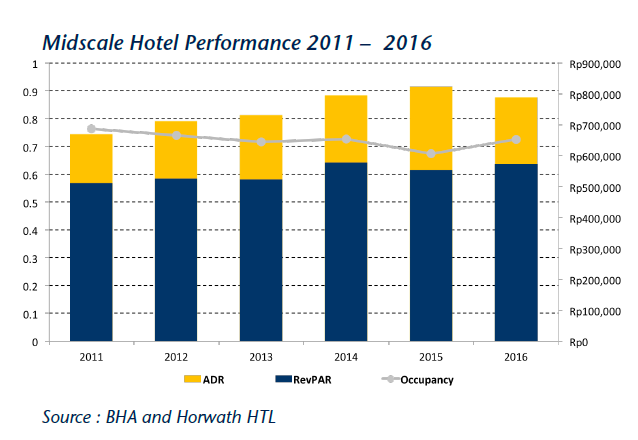 As discussed above, the strong arrivals growth has not been enough to maintain hotel rate performance. 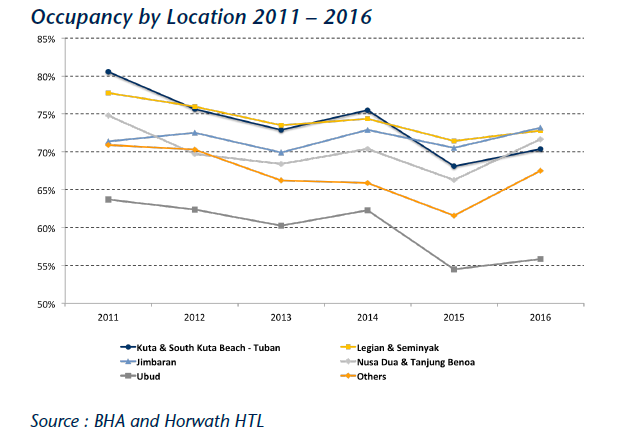 Hotels have been adjusting their rate strategy in response to the changing arrivals demographics and the results of which are felt across Bali in each of the listed sub-markets. Jimbaran weathered the storm the strongest with a small 1% fall in USD ADR, followed by Others. 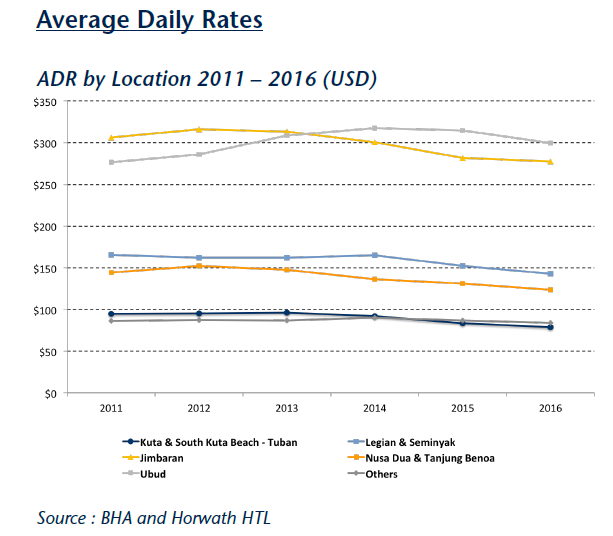 In each of the submarkets Nusa Dua / Benoa, Kuta & Legian / Seminyak, USD ADR levels fell the furthest, a high 6%. As the mass market is more price-sensitive a longer recovery time will be required to push rates back up following the slashing currently underway.